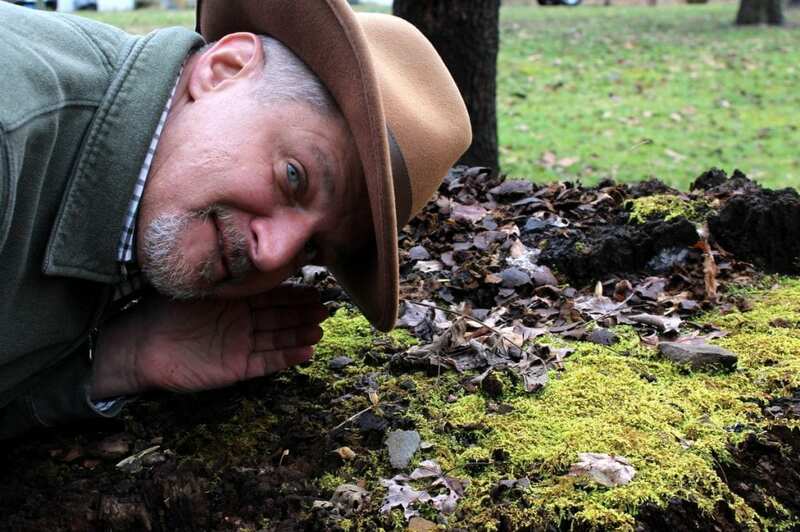 David Sibray listens for the ghostly rumble of “Old Thump” in Wyoming County; its origins may be geologic. Like Mitchell, now curator of the Gilbert Museum at nearby Gilbert, West Virginia, other witnesses described the thump as the sound of horses trotting along the road — others as a rhythmic thunder or a deep rumble at the threshold of sound. 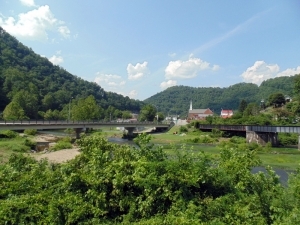 Construction of a dam on the Guyandotte River commenced in the late 1960s, and residents of Codger Town moved while R.D. Bailey Lake slowly filled the valley. But the legend didn’t drown beneath the rising waters. It transformed and grew to include the lake and the land itself. Some now attribute the rumble to a subterranean source. According to Mitchell, historian Ralph Justice in the 1948 book “The Ghost of the Guyan,” made perhaps the first references to an underground river that ran beneath the Guyandotte River, possibly giving rise to many tales that came after. Mitchell says natural gas that bubbles to the lake’s surface may well have something to do with the cavity or some other geologic source. Sibray coincidentally finds a ghostly hobby-horse hoof along lake. I recalled having heard whispers about the underground river in the early 1990s when I was an editor for The Coal Chronicle, a mining-industry magazine that often covered stories in the region, but I can’t recall who told me the tale. Then last year I grew interested in the legend again while looking for a good hiking trail in the area. 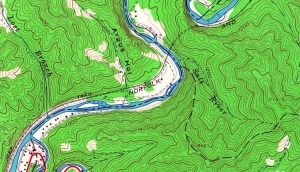 I found mention of a “Salt River Trail” mapped in the wildlife-management area that surrounds the lake. However, the “river” appeared to be only half-a-mile long! R.D. Bailey superintendent Brian Morgan confirmed that the Army Corps of Engineers maintains a trail to the swift-falling stream that is mapped as the Salt River, though he had never heard the tale and didn’t recall anything about the origin of the name. By chance, I turned to Erin Ellis-Reid, community-outreach director for Active Southern W.Va., an organization that encourages active living in West Virginia’s south-central counties. Erin shares a love for the outdoors and grew up nearby. I asked her if she’d ever heard of the Salt River, when she reminded me of Old Thump. Her grandmother Lila Ellis lived on a farm near Codger Town, and Erin grew up hearing the tale. Guyandotte River at Gilbert, W.Va.
All of this said, it turns out there’s little scientific evidence to support the idea of a cavity or of an underground river, according to geologist Mike Spore, who studied the area during the development of the dam. Such a feature would surely have been discovered by engineers. However, there’s plenty of geologic wonder to discover, Spore said, and the origin of the name “Salt River” likely has a source in possible salt springs or seeps that may well up in the region. “It is a very unique dam, and we brought in people from the Snowy Mountain projects in Australia to work on it because of the seep-and-spring conditions in the abutments and foundations,” he said. 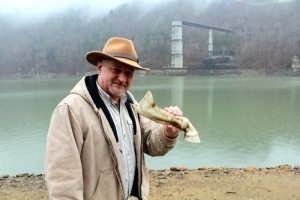 Geologic wonders such as brine springs and burning springs, fueled by natural gas, are not unheard of in southern West Virginia, Spore said. “We encountered those certainly at Burning Springs, near Charleston, at the old Dickenson Salt Works. And the Smithsonian in the 1840s investigated burials and earthworks here as well as areas where you had brine seeps and springs and natural gas discharges at the surface. So, it’s as likely as not that brine and gas trapped hundreds of feet beneath the lake may rise up through fractures to feed springs and bubble up into the lake bed. Whether that bubbling might have caused the rumbling known as Old Thump, only future research can tell. 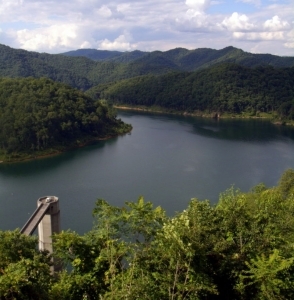 Next articleLeah Nestor plans a perfect day in Marion County, W.Va.